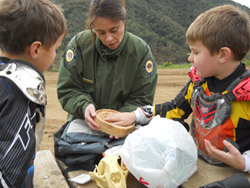 The Hollister Hills Junior Ranger Program fuses the enjoyment of riding ATV or dirt bikes with safety, trail knowledge, history of the park, stewardship, and the natural wonders of the park. The program is tailored for youngsters, ages 6-11. 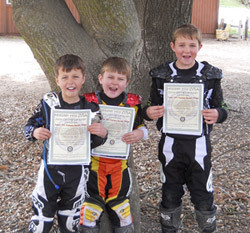 The program is a fun way for kids to learn about many of the treasures Hollister Hills offers and what everyone can do to protect our ability to ride for generations to come while earning great awards along the way! The program can begin at home by downloading the Hollister Hills Junior Off-Highway Ranger Activity Book and the Junior Ranger Logbook. Then, bring your completed activity book to any park staff during your visit and you will receive your official Junior Ranger Certificate. Bring your Logbook with you to track your attendance and learning throughout the program. 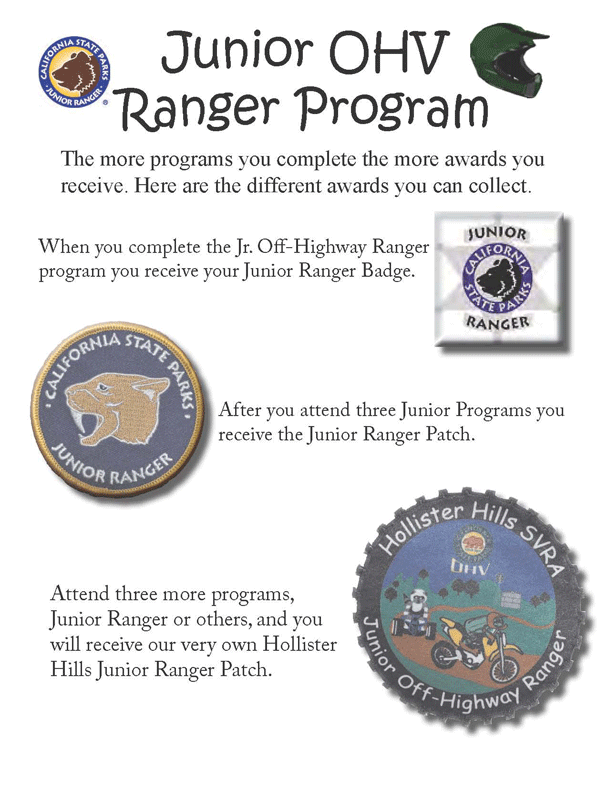 Participate in the Junior Off-Highway Ranger program and you will receive your Junior Ranger Badge. This program focuses on responsible recreation. More specifically, safety gear, vehicle knowledge, trail conditions and TREAD Lightly! principles. This program will offer mini versions of elements youngsters may encounter while on the trail. For example, hills, sandy areas, off-camber sections of trails, and rocks, all miniaturized to expose young riders to these trail elements while building confidence by ensuring they will be able to conquer them. Participate in three additional Junior Ranger programs, (they occur on most weekends during red sticker season) and you will receive your Junior Ranger Patch. After that, attend three more programs of any kind—campfire programs, nature walks, guided tours, Junior Ranger programs, etc.—and you will receive our custom Hollister Hills Junior Off-Highway Ranger patch. This is a one of a kind patch that you won't find anywhere else! We hope the Hollister Hills Junior Ranger program will show youngsters about riding responsibly and equip a new generation of riders to appreciate the joy of riding at Hollister Hills and everywhere else.